…….will helps you to dominate in major search engines. I will create 30 Plus Web2.0 Blogs using 30 most popular and high authority PR9 blogging websites. Only do follow and rapidly indexing domains will be used having high PA and DA values. Again there will be mix anchored and no anchored some with about me and some without which is most natural, relevant and search engine friendly. Again I will index all these links which will be a bonus for you. Important: Always prefer High quality manual works from trusted source rather than ton of low quality backlinks that just doesn't work; a handful good high quality links from trusted domains like these will do more good for you SEO efforts. 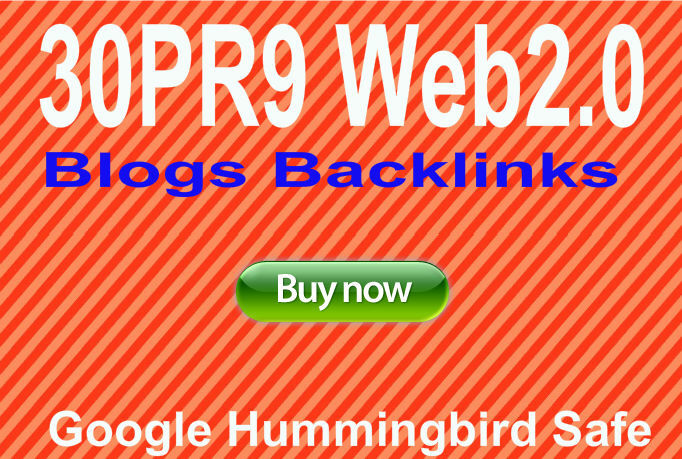 Provide 30 Do follow PR9 web2 Blogs from unique 30PR9 Authority websites Best for Seo is ranked 5 out of 5. Based on 22 user reviews.